PATNA: RJD chief Lalu Prasad's wife and former Bihar Chief Minister Rabri Devi on Friday made an emotional appeal to her elder son Tej Pratap Yadav to return home. 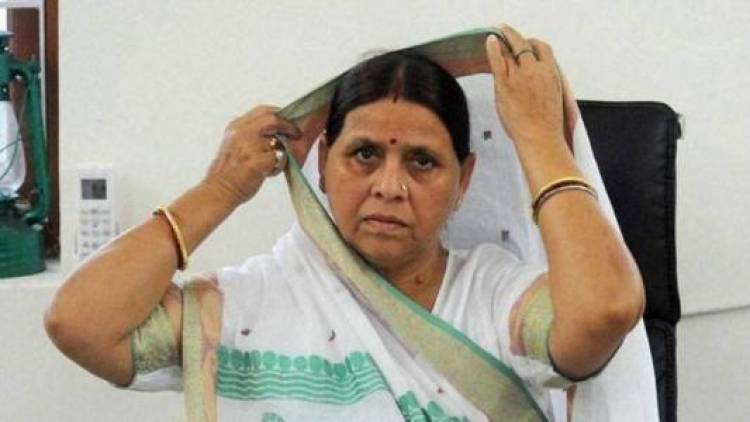 A day after voting for the first of the seven-phased Lok Sabha polls in Bihar, Rabri Devi, who is pained by Tej Pratap's decision to stay separately in the state capital, instead of living with the family, said in Hindi: "Bahut hua, laut aao beta" (Enough son, please return home). Tej Pratap Yadav has not returned home since he visited his father Lalu Prasad in Ranchi last year, after filing a petition in court seeking divorce from his newly-wedded wife, family sources said. Tej Pratap Yadav got married in May last year to Aishwariya Rai, the daughter of a senior RJD leader. Rabri Devi told media here that there is no truth in the reports of differences between her two sons Tej Pratap Yadav and Tejashwi Yadav. "It is all a creation of vested interests," she said. She said there have been attempts made to divide her family. "Some people have been trying to instigate and mislead my son. It is possible that our rivals', BJP and JD-U, people may be behind it," Rabri said in a reference to Tej Pratap Yadav. She also revealed that she telephoned her son daily to talk to him. Tej Pratap has, however, repeatedly expressed his displeasure over younger brother Tejashwi's refusal to field a candidate of his choice from the Sheohar Lok Sabha constituency. Rabri also expressed her serious concern about the absence of her husband, who has been undergoing treatment at a Ranchi hospital after being convicted in the fodder scam case. "I miss Laluji...his absence is really painful. Without him everything is useless. Hope,he will come back soon," she said.